Vancouver Island Blog is featuring a four-part series to introduce you to four very special Vancouver Island kids who are making a huge difference in their local communities through Variety – The Children’s Charity. Last week we met Angel and today you’ll meet Nicholas. Months before doctors could make any kind of definitive diagnosis, Nicholas’ mom knew something wasn’t quite right when he was born. Nicholas – or Nick as he prefers – was born with Down syndrome. However, Nick’s doctors could provide only the most basic of information. Because the internet could only provide so much, Nick’s family eventually relocated to Campbell River. There Nick was able to receive the crucial occupational therapy and physiotherapy that helped him grow and develop to his greatest potential. 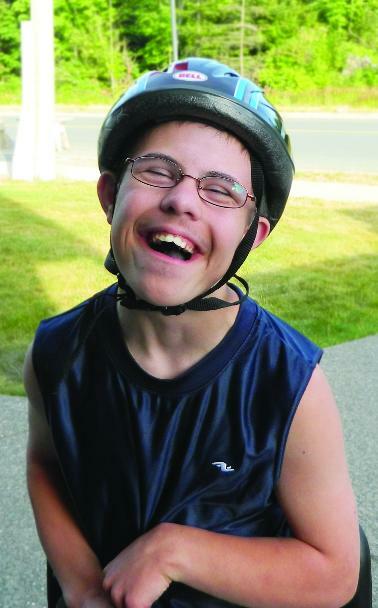 Today Nick enjoys swimming, skating and peddling around on the adaptive bicycle that was purchased for him through Variety. It seems in Nicholas’ case, what goes around comes around. Before Nick was born, Variety was one of the charities his family donated to. “I never thought that one day they’d be helping us,” Allison remembers. Nick is one of 13 kids around BC participating in this year’s Coin Drive. His goal for 2012 is to raise $3,600 and he’s almost half-way there! If you can support Nick in helping other kids around our Province and across Vancouver Island, please visit Nick’s personal fundraising page. Proceeds from the 2012 Kids’ Coin Drive will go towards helping children who have special needs and their families with grants for things like emergency transportation costs to out-of-community hospitals, expensive medications, mobility and communication devices, and therapeutic programs to give them the same chances in life as other children. If you, your family or your business would like to support the Coin Drive between now and October 31st, please visit the Kids’ Coin Drive website today. Cash donations are also being accepted at all IGA, Marketplace IGA and Bank of Montreal locations.